"Jacqueline Cochran was looking for WASP. They told me I would have to be interviewed and they would contact me when they came to the Wichita area. But I didn’t wait for that. I went down to Houston for my interview, to speed things up. And I think that’s one of the smartest things I did." 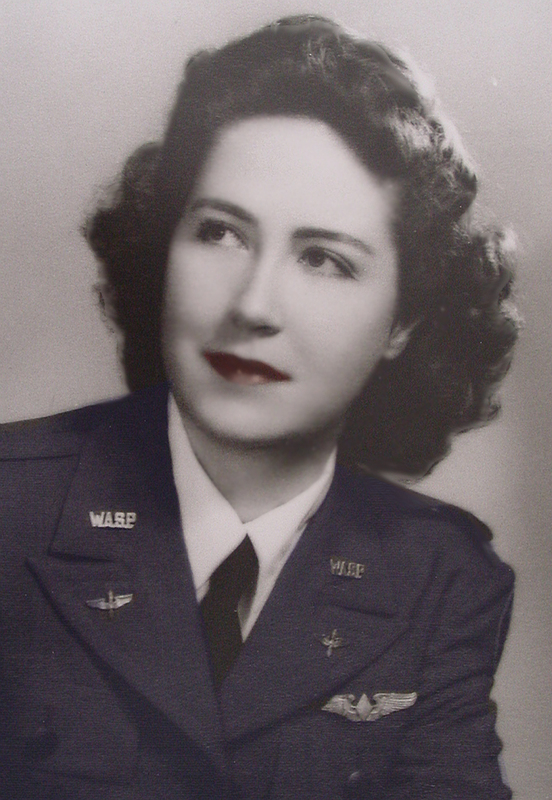 Lucile Doll Wise, Women Airforce Service Pilot (WASP) of World War II and beloved mother and grandmother, died peacefully August 2, 2018 at her residence in Arvada, Colorado, one day after her 98th birthday. She was born August 1, 1920 in Larned, Kansas, the daughter of Fred and Edna Barstow Doll. She was a graduate of Larned High School in 1938, and the Colorado Woman’s College in Denver Colorado in 1940. She learned to fly in Wichita, KS and was accepted for training as a WASP pilot in May, 1943. She was among the first women pilots in history to fly military aircraft. After training, she was assigned to the Army Air Forces Weather Wing in Ashville, NC and later in Kansas City, MO, and served until the WASP were disbanded in December of 1944. On September 5, 1950 she married Robert W. Wise and resided in Alexandria, VA until 1982, when she returned to Larned. He preceded her in death. She volunteered in the WASP office in Washington, DC in 1977, working on lobbying efforts to obtain military recognition and Veteran’s benefits for WASP members. Within the WASP organization, she served in numerous roles including Regional Director, By-Laws Chair, Scholarship Chair, and President. Lucile was a member of the Presbyterian Church and was a member of a number of groups including the Colorado Aviation Historical Society, the Women Military Aviators Association, and Women in Aviation, International. She was active in community and church affairs, and served as a volunteer archivist and docent for several years at the Santa Fe Trail Center in Larned. In 2010 she and her sister WASP were awarded the Congressional Gold Medal, highest civilian honor the Congress can bestow. She is survived by her daughter, Susan C. Carl of Denver, CO; a son, Robert B. Wise of Loudon, TN; two grandchildren, Emily Carl and David Wise; and two brothers, Wayne Doll of Warsaw, MO, and Jack Doll of Senecaville, OH. A memorial service will be held on September 2, 2:30 pm, at the Brookdale Meridian, 9555 W. 59th Ave. in Arvada. In lieu of flowers, donations are suggested to the WASP Endowment, Texas Woman’s University, PO Box 425618, Denton, TX 76204-5618. Respectfully reposted with quote and photos from Wings Across America. In 2000, Lucile welcomed us to her home in Aurora, Colorado for one of our first Wings Across America interviews in Colorado. We began interview and, once she realized we were cheering her on, her smile came easily. She was a great subject. Over the course of the next few years, Lucile became a touchstone of sorts, always asking me where I got my facts, challenging conclusions and every once in a while, being surprised and delighted with my answers. I always appreciated her loyalty to the WASP and, above all, to telling the truth. God bless this special lady and to all of us who loved her.